I find that I get distracted from the task at hand very easily. My latest distraction from the FreeSWITCH on OpenBSD project has been a renewed interest in UltraSPARC hardware. I recently purchased a pair of Sun Fire V215 servers to act as routers, and on the way I got interested in the newer generations of UltraSPARC processors, which I think are very interesting for a variety of workloads that I have to deal with. Anyway, this evening while out at my parents place I rummaged in the basement for a few minutes trying to find an old system I had left out here a few years ago. Sure enough, sitting under a small pile of dust, I discovered my old Sun Blade 100 workstation. I had purchased the machine some years ago when I was working on a project which I wanted to ensure ran on big-endian architectures. Plugging in the system, I was pleased to discover everything was exactly as I had left it (apparently in 2007 since it still had a OpenBSD 4.1 install disk inside it). 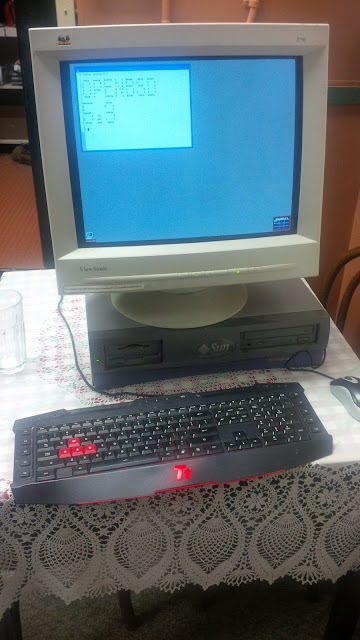 Quickly burning a copy of OpenBSD 5.3 for UltraSPARC, and running the install took about 10 minutes and I was pleased to discover a fully operational desktop. These workstations were very useful in their day, and I am pleased to see that mine is still running. Performance is a little lower than I would like for some activities like browsing the web, but its actually perfectly acceptable as a development environment (and nicely free of distractions too).